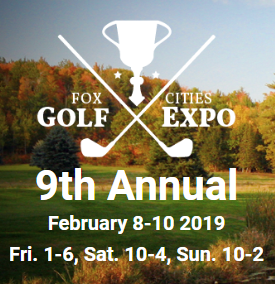 The Fox Cities Golf Expo runs the weekend of Friday, February 8th through Sunday, February 10th because – let’s face it – golfing conditions outside aren’t the greatest this time of year. So it’s the perfect time to check out exhibitors from local golf shops, golf equipment companies and golf courses, demonstrations and door prizes. All attendees of the expo will receive a free copy of the latest issue of The Golf News. Prizes and giveaways include hourly door prizes, a putting contest, and more. The Grand Prize in a 4-day, 3-night Stay-and-Play Package with unlimited golf from Tuscumbia Golf Course in Green Lake! 1pm – First 500 attendees receive a free 18 hole round of golf courtesy of Reid Municipal Golf Course. 10am – First 500 attendees receive a free 18 hole round of golf at both Shamrock Heights Golf Course and High Cliff Golf Course. 1pm – First 500 attendees receive a free 18 hole round of golf courtesy of Branch River Golf Course. 10am – First 500 attendees receive a free 18 hole round of golf courtesy of Irish Waters Golf Course. 12:30pm – First 500 attendees receive a free 18 hole round of golf courtesy of Thornberry Creek Golf Course. Buy tickets online for $5, which we recommend because admission at the gate is $7. Ages 16 and under are free with paid adult. The first 500 to buy online for each daily session will get a FREE 18-hole round of golf. Appleton is a fun city with a lot to see and do. I-41 and U.S. 10 bring you there via freeway, and Highways 15, 47, 96, and 125 bring you into the heart of town. While there, check out the Houdini Museum, the Hearthstone Historic House Museum, Fox River Brewing, Stone Arch Brewpub, the bustling strip on College Avenue downtown, and so much more!